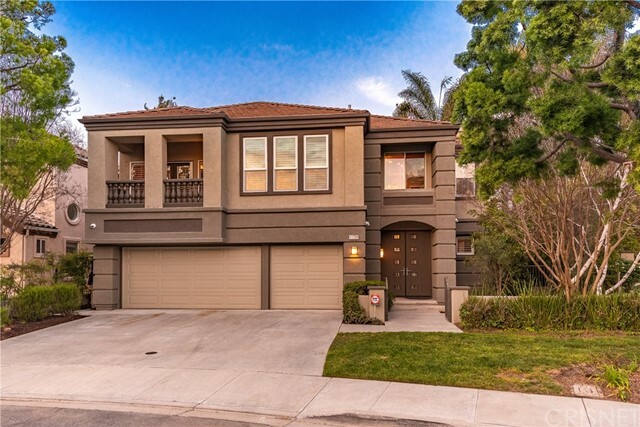 All Moorpark homes currently listed for sale in Moorpark as of 04/23/2019 are shown below. You can change the search criteria at any time by pressing the 'Change Search' button below. If you have any questions or you would like more information about any Moorpark homes for sale or other Moorpark real estate, please contact us and one of our knowledgeable Moorpark REALTORS® would be pleased to assist you. "CastleRock Ranch is a true turn key 22 acre professional equestrian center. This is a horse boarding business highly respected in the industry. Ranches like this rarely come available. Owner is retiring. 150+ stalls 34 mare motel stalls, room to grow, professional dressage area with sand/rubber full and a half court arena, lighted show stadium, 11 tack rooms, many private trainers offices, 100x200 jumping arena, 100x200 lighted arena, 150x200 jumping event arena, lighted horse racks, grooming areas, 3 round pens, two lunging arenas, western area, hot walker, turn outs, exercise track, manicured grounds beautiful 4 bedroom house with private gates, public restroom, horse trailer storage, 3000sq ft AG building, large ranch office trailer for 2 offices that run the ranch business, 24hr. ranch manager on site and so much more." "Set on a hilltop knoll, this custom 4,500 Sq Ft Mediterranean Villa is situated on a private 43 acre avocado ranch overlooking all of rural Moorpark and Somis. Old World charm and modern elegances blend seamlessly together, creating a warm and inviting atmosphere for all who enter the 4br/3.5bth single-story home. Travertine floors, wood beamed ceilings and a stone interior entryway are just a few of the home's special features. Step outside onto the covered veranda and gaze across the infinite pool towards the fertile fields & majestic Los Padres Mountains. Approximately 35 acres are planted in income producing Haas avocados served by a private agricultural well. An oversized workshop with three roll up doors is perfect for one's tractors and/or expanding car collection. An oversized arena and two-stall barn are ideal for the equestrian hobbyist or private trainer. Assorted pipe corrals and shade coverings are home to other farm animals, including a family of sheep. Treat your friends to spring and summer fruits, including pomegranate, orange, lemon, peach, and fig." "Hill Top Single Story 5 Bedroom 4 Bathroom Home includes 2 Bedroom Guest House, Maids Quarters and 4 Car Detached Garage . 360 degree views on approximately 10 Acres!Built in 2004 this property offers luxurious living space with views throughout. Grand entry with vaulted ceilings. Formal living room with fireplace, plantation shutters, custom windows , recessed lighting and ceiling fan. Gourmet kitchen with granite counter top, custom cabinets, built-ins, two pantries, seperate breakfast eating area, center island, and travertine flooring. Open floor plan to family room with fireplace and custom built-in entertainment center. Grand master suit with fench doors to patio, steam shower, badet, jet tub,open shower and generous walk in closets. Beautiful gardens of blooming flowers line the walk ways to fireplace,spa, waterfall, koi pond,barbecue and wet bar. Custom covered gazebo is perfect garden setting for any special event. Multiple outdoor retreat settings are a plus. 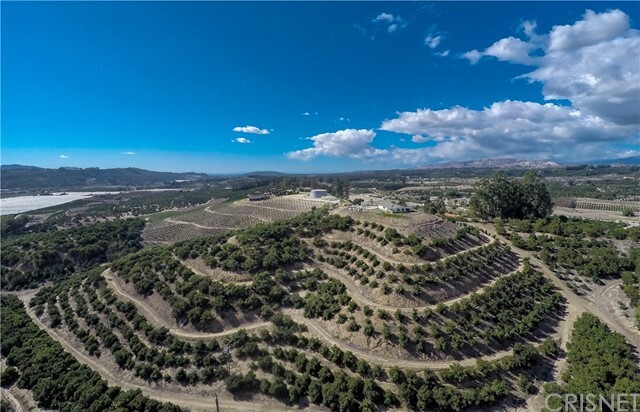 This property is suitable for horse pastures, paddocks ,avocado orchards, lemon groves or vinyards. Private, quiet and unique in design and location!" "Prime 23 acre avocado & lemon ranch PLUS 1,200 sq ft hilltop Spanish hacienda with panoramic views! Located in the prestigious Rancho San Miguel area of West Moorpark near Somis, the groves have been meticulously farmed and managed. The owner has consistently grossed $300,000+/- from the annual harvest. Ten acres of Haas, Lamb Haas and Gem variety avocados have been strategically planted to maximize production levels. Ten acres of lemons enjoy three harvests per year, and are planted in two sections on the ranch. Fuller Falls Water Co provides POTABLE well irritation to the orchard and residence, with ag rates currently set at an affordable $270 per ac ft. The 2br/1bth home with four-car garage is set on a one-acre hilltop plateau with ample room to build a larger residence & other outbuildings. The ranch enjoys a private entrance from the other properties in Rancho San Miguel, with direct access to Waters Road." "Phenomenal dream home at the Master's at Moorpark Country Club, a gated community of luxurious estate homes located around the acclaimed 27-hole golf course of the Moorpark Country Club.The seller's have spared no expense customizing and upgrading this home. Over $600K in upgrades plus $135K lot premium make this home a must see!The entry doors open to a private courtyard area perfect for entertaining and looking up to the stars. This home features 6 bedrooms and 6.5 bathrooms.This includes a separate casita (guest quarters) with bedroom and bath plus a wet bar. The gourmet kitchen is open to the family room with Wolf Pro appliance package, high end slab granite book matched to waterfall on the oversized island plus matching back-splash. Top of the line cabinets with custom touches. Oversized custom pantry with an additional stainless steel refrigerator and loads of storage. Custom bar and wine pantry with walk thru access to the formal dining room.Family room features built in home entertainment system plus custom sliding doors that open to the amazing view and large backyard with plenty of room for entertaining.Take your breath away master suite with ocean views! 4 car garage combines 2 oversized 2 car garages with built in cabinets and epoxy floors!" "Incredibly Rare Moorpark Offering! View! View! View! Incredible 20.7 Acre Prime Hass Transitional Avocado Ranch! Astonishing Top Of The World Nearly 360 Degree Views! Wonderful 3 Bedroom & 3 Bath Home With Inviting Spa! Cooks Kitchen! Spacious Living Room With Fireplace! Wet Bar! Marvelous Master Suite with Spa Tub! Exquisitely set on this Gated & Partial Fenced Breathtaking Hass Avocado on 20.7-Acre Transitional Ranch with Total Privacy! This Beautiful Orchard Is Very Well Maintained! Great Passive Income! Large Flat Pad! Plenty Of Parking For Equipment, Rvs, Etc! Unlimited Potential! Create Your Dream Estate Home & Ranch Or Perfect As Is! Great Location! Minutes To Everything! Rarely Does A Property Like This Come On The Market! Incredible Opportunity! Rare Offering! This Amazing Property Sells Itself! Must See! Standard Sale! Do Not Miss! Moorpark Ranch & View Living At Its Best!" "This stunning Santa Barbara Model in the prestigious gated community of The Masters at Moorpark Country Club has the modern flare you desire. This premium view lot has 5 bedrooms, 5.5 baths plus office with 4,967 square feet. You can spot Boney Mountain and the acclaimed 27 hole golf course from the master bedroom balcony and the well manicured backyard. Enter the foyer through the double doors, once inside take a moment to admire the dramatic double staircase, the soaring ceilings and the Schonbek crystal chandelier. Beautiful upgraded tile flooring on the first floor; second floor has a plush, upgraded carpet. The chef's kitchen was tastefully designed; Cesar Stone counter tops, stainless steel appliances, extended island w/vegetable sink, custom cabinetry that extends to the ceiling and eat-in dining area for casual meals. Family room has a cozy gas fireplace with large slider to give access to one of the largest lots in the community boasting a built-in BBQ w/fridge, basket-ball court, fruit trees and children's custom playhouse. The master bedroom features private bathroom, 2 closets, soaking tub, spacious shower, 2 separate vanities and private balcony. All secondary bedrooms have private bathrooms. Truly one not to miss." "Rare Single Story Home.This elegant 4 +4.5, with over 4000 SqFt in the Exclusive Gated Country Club Estates is breathtaking! When you enter through the private courtyard into this stunning single story situated over the Championship Golf Course. Backyard is an entertainer's dream with a gorgeous pool and spa, covered cabana with Lynx built-in BBQ, fireplace, flat screen TV and a rose garden to die for! Gourmet kitchen boasts granite counters, island and breakfast bar, Viking stainless appliances, built-in refrigerator, double oven, 6-burner range, 2 Bosch dishwashers, built in microwave and large walk in pantry. Kitchen opens to large breakfast area and family room with media center and built-ins. Crown molding throughout, recessed lighting, custom chandeliers and rich hardwood floors. Formal dining room with inset ceiling, and elegant window treatments.Enormous master suite with sitting area and fireplace. Large Master bath with double sinks, two powder rooms, huge walk-in closet, oversized soaking tub & shower w/ glass blocks. All additional bedrooms have en suite bathroom. This spectacular home has two separate 2-car garages and the Solar paid for! This estate home offers peaceful, resort-style living . Welcome Home!" "Entertaining & Resort living at its best!! 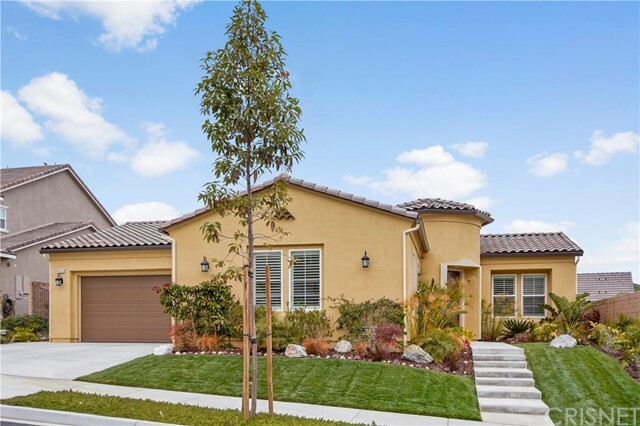 Located within the highly sought after Master's community at Moorpark Country Club Estates! This stunning highly upgraded 5 bedroom, 5 bath home offers seamless indoor/outdoor living. The seller spared no expense when upgrading this beautiful home. There is a private office and a downs stairs bedroom with a full bath. The gourmet kitchen boasts gorgeous granite counter tops/large center island, upgraded stainless steel appliances and opens to the spacious family room with buillt-in speaker/surround sound and pocket doors leading out to the amazing backyard which features a pool/Grotto spa with a waterfall, glass ice firepit, and a custom pergola with a built-in BBQ and sitting area that is perfect for entertaining! The master suite has a cozy fireplace with a sitting area, a large walk-in closet with custom built-ins, and a luxurious master bathroom with his and her sinks, marble floors, jacuzzi tub, and a glass shower enclosure! There are 3 additional upstairs bedrooms and a 4 car garage with epoxy floors! Excellent schools and close to restaurants, shops and freeways." "Panoramic views in prestigious Gated Community of Moorpark Country Club Estates! Elegant home - 5 bedrooms, 5 1/2 baths, 5,851sf of living space, lot size 19,179 sf. You will love the dramatic 2-story grand foyer w/ dual staircases, gorgeous marble floors & vaulted ceiling. Huge living room w/ fireplace adjoining formal dining room. Fabulous open floor plan, great for entertaining. Spacious gourmet chef's kitchen w/ granite counters, two large center islands, abundant cabinetry, walk-in pantry, built-in refrigerator, stainless steel appliances, w/ an add'l eating area between the kitchen & family room w/ fireplace. Downstairs features large guest bedroom suite w/ full bath & an office w/ built in's. Upper level features 3 ensuite bedrooms, a luxurious master suite w/ fireplace, sitting area, huge walk-in closet & a private room off master that could be a gym or office and large private balcony overlooking dramatic sweeping views. Spa-like master bath w/ his/hers vanities, oversized tub & shower. Front Balcony joins two upstairs bedrooms. Other features include upstairs laundry room, recessed lighting, whole house vacuum, security system, sound system inside & out, fire sprinklers & wood burning fireplace. Beautifully landscaped Entertainer's Backyard." "Welcome to prestigious Country Club Estates and experience a timeless beauty of stone, wood, iron and incredible design features for the ultimate in Living. This Beautiful home features so many upgrades and improvements that should not be missed....starting from a stacked stone exterior leading to a stone floor foyer, high vaulted ceiling and beautiful wood & iron circular staircase. Off the entry is a lovely office/music room, a spacious living room with fireplace and formal dining room with stunning window textile coverings. The gorgeous kitchen boasts dual islands, granite counters, dual ovens and fabulous wood cabinetry.... The huge family room features beautiful stone fireplace, amazing wood floors and a custom wall cabinetry for the entertainment center, wine bar and showcase cabinet. Finally, the first floor offers a lovely powder room, direct access to a 4 car garage and a full guest bedroom suite with private bath. Upstairs you will find the East Wing belongs entirely to the Master Suite and getaway....it features an exceptionally spacious bedroom, private sitting area, balcony and spa like bathroom. With jetted tub, separate vanities, shower and his and her closets unique to this property. Two additional spacious bedrooms with their own private baths. Finally, the Magnificent rear yard speaks for itself. Pool/spa/cabana/patio. A Beautiful home to call home." 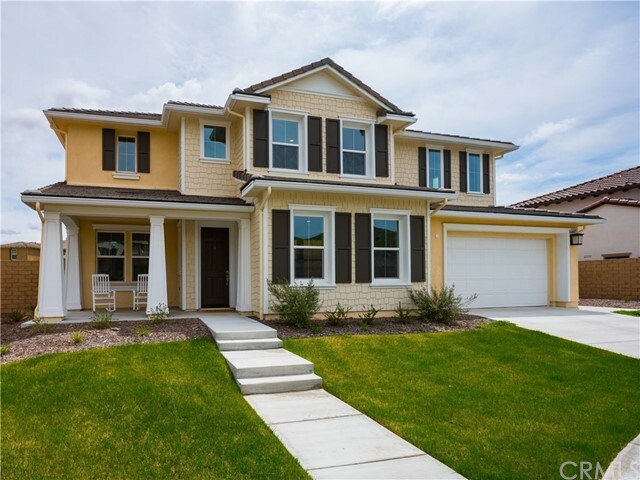 "Come see this Gorgeous 3821 sq ft one story home. There is a private courtyard with a fireplace in the center of the home . Retractable slider doors lead to the tropical pool and spa. The backyard has a vast view of the open space. Large open kitchen attached to family room. 4 bedrooms and 3.5 bathrooms. The upgrades are endless through out the home. 3 car garage, plenty of storage . Solar lease , tank-less water . Many upgrades installed when home was brand new.,heater,dual zone HVAC, soft water system ..... RV access or extra parking to the side of the house." "Welcome to this spectacular 4 bedroom, 4.5 bathroom, 4,077 sqft home in the gated Pinnacles at Moorpark Highlands! Step into the grand foyer with sweeping dual staircase, spiral chandelier, and Carrara marble porcelain tile floors. The tile floor carries throughout the lower level connecting the light & bright formal dining room, formal living room, and bonus office. Step into the modern chef's kitchen with beautiful dark cabinets contrasted by white stone counters. The kitchen boasts high end stainless steel appliances, huge island, and a walk in pantry. Adjacent family room is designed for entertaining with a bar, sleek built in media cabinets, and lanai door that creates a seamless flow from indoor to outdoor living. Desirable floor plan has downstairs bedroom with ensuite. Upstairs open the double doors to the master bedroom with an oversized sitting area, huge windows, and designer carpet. The master bath has separate vanities, a sunken tub with view of the mountains, a walk in shower, and huge walk in closet. 2 good sized secondary bedrooms both have en-suites. The backyard is perfect for relaxing with gorgeous landscaping, covered patio, and firepit positioned for watching the sunset. This is the one you've been waiting for! Welcome home!" "Stunning 5 Bedroom, 5.5 Bath, Rosecliff Model in gated Meridian Hills built in 2016. Elegance abounds with Sweeping Spiral Staircase, Hardwood Floors, Formal Living Room with cathedral ceiling. Formal Dining boasts Butler's Pantry w/ wine fridge & glass cabinet doors. Fabulous Great Room open to casual dining room. French doors lead to outdoor California Room with fireplace and charming deck. Gorgeous gourmet Kitchen with upgraded cabinetry, granite countertops, pendant lighting, large island with breakfast bar and stainless appliances including built in fridge, double convection ovens and more. Motorized window coverings in living room and great room. Downstairs includes an ensuite Bedroom plus a separate powder room for guests. Pristine backyard has lovely covered patio, spacious deck with seating area, grassy area, built in BBQ, rose garden and relaxing side patio terrace. Luxurious Master Suite has enormous balcony w/ exceptional views & staircase providing direct access to backyard. Bonus Room upstairs provides ample space for teens, office or home gym. Two Laundry Rooms (1 up/1down). All gates, decking finished in beautiful wrought iron design. 3 Car Garage plus additional storage garage. Meridian Hills has pool, spa, tennis, basketball & park." "Stunning pool home located on an oversized lot in the beautiful Tuscany neighborhood of Moorpark. Fabulous curb appeal with its charming courtyard adorned by mature trees & blooming flowers. The grand double doors usher you into the formal entry & living room with soaring ceilings, beautiful fireplace, & lofty formal dining area. The chef's kitchen has custom cabinetry with pullout shelves, spice drawer, oversized center island, quartz countertops, glass tile backsplash, GE Commercial size refrigerator & Monogram Vent Hood, double ovens, built-in Thermador coffee maker. The kitchen opens to a spacious breakfast area & family room featuring an upgraded fireplace & bar. Two master suites with walk out balconies, spa-like bathrooms with large steam showers & double jetted tub. Three additional bedrooms with updated bathrooms. Upgraded throughout with gorgeous slate tile, wood flooring, newer HVAC systems, new dual pane windows, plantation shutters, security & Intercom systems, upgraded baseboards, crown molding, designer paint throughout, recessed lighting, closet organizers, newer pool equipment and much more! The resort style backyard features a large pool & spa complete with waterfall, built-in seating areas, three gas fire pits, full outdoor kitchen & all weather patio. This amazing yard also offers maintenance free landscaping, a custom built playhouse with climbing wall, putting green,cushioned turf. Three car garage with built-in cabinets and a secondary laundry area." "This Pristine Condition Single Story Home offers 4 bedroom, 3.5 bathroom, 3 car garage perfectly situated at a cul-de-sac. Beautiful high quality custom upgrades, recessed lighting, crown moldings, window shutters, window screens, hardwood flooring. The dining room and kitchen have French doors with upgraded door screens that lead to a center courtyard with custom designed flooring, with a wall fountain perfect for entertaining! The eat-in chef's kitchen beautiful custom built cabinets, back splash, walk-in pantry, granite counters, quality stainless steel appliances, and a huge granite center island/breakfast bar. The adjacent family room has a cozy gas fireplace surrounded with built in cabinets, and has a wide slider door with roll up/down cover for more privacy. The master suite bedroom leads to a gorgeous bathroom with a large soaking tub, and a glass enclosed shower all with marble and custom tile finishes. Master bedroom has 2 french door with custom built shutters lead to the atrium and back yard. The 2 good size bedrooms has jacknjill bathroom with a tub/shower combo. The other bedroom has its own full bath, walk-in closet and own access to the garage perfect for guest or in-laws room. Well maintained front yard, beautiful pavers throughout side and backyard with a custom built stone BBQ area, granite counter top, outdoor refrigerator and 2 fountains. Easy access to excelled schools, parks, restaurants, shopping, and freeways." "Spectacular Luxury Home located in Trieste Gated Community. Almost 5000 square feet with 6 Beds 4.5 bathrooms with study/office. Over-sized Formal dining and Formal Living room with fireplace. Gourmet Kitchen with center island with built in Fridge and double oven. Open and airy family room with Built-ins & Fireplace. Two huge Master bedrooms one downstairs and one Master retreat upstairs with Built-ins & Master Bathroom and walk in closet. High Volume Ceilings, with beautiful wood-like flooring throughout. Lush landscaping Front/ backyard with Porch and central Courtyard with Fountain. Large 2 car Garage with separate room attached for storage. Tesla Solar lease for low electric bill." "As you drive through the security gates of prestigious Meridian Hills Gated Community and begin to approach this spectacular residence, you quickly realize you have entered into a private oasis of gorgeous homes affording you the ultimate in privacy and exclusivity. The location could not be more ideal than on Red Bird Court, and just a stone s throw away from all of the community s vast amenities. The interior of this beautiful home is architectural splendor at its best with crisp lines, soaring living spaces, en suite bathroom in all 5 bedrooms, a gourmet chef's kitchen, a spectacular formal dining area, custom cabinetry, surveillance camera system, and expensively remodeled bathrooms. The master wing boasts a spacious sitting room, grand walk-in closet, soaking tub, large shower, LED lighting and a built-in vanity area. You will find yourself enjoying the oversized yard, lavish landscaping with mature fruit trees, romantic outdoor patio spaces, sitting areas, custom hardscape, and custom built-in BBQ station all while relaxing in the peaceful entertainer s back yard. The Meridian Hills Community is highly desirable and boasts a community basketball court, gorgeous pool, recreational area, tennis court, and much more. No detail has been overlooked in this spectacular family estate home." "Welcome to Meridian Hills! Come and see this beautiful Belmont floor plan in the heart of Moorpark. Newly built in 2018, this gorgeous Cape Cod exterior home sits on a large 10,790 square foot lot, boasting with 5 bedrooms, 4.5 baths plus loft. Step inside and you will see an interior courtyard perfect for entertaining and relaxing. The kitchen features a large island with granite counter tops extending through the butler s pantry. The family room, kitchen and breakfast nook area share an open concept floor plan. The multi-sliding door gives the space a bright and airy feel that opens towards the backyard and California Room for al fresco dining with indoor/outdoor lifestyle! The master bedroom has a retreat area with a stunning partial view of the mountains. It also has a spa-like master bath with a separate bathtub and has a 2 large size closets. The community has a pool, spa, 2 tot lot parks, hiking trails, tennis and basketball courts. This home offers tons of great features and natural lighting that you will truly enjoy the comfort of relaxing at home. The sellers welcome you to take a tour!" "Built in 2007, and located on a quiet cul-de-sac in gated Meridian Hills of Moorpark, this single story delights with light and bright rooms that surround a lovely interior courtyard. This unique property features hardwood floors, a formal living and dining room, home office or private guest suite (you choose), grand kitchen with a massive center island with beautiful granite top, connected family room that spills onto the patio, and a Master Suite that thrills. All the rooms are light and bright with high ceilings and large windows, and the spa-like master bath is dazzling. Be the first to experience the gorgeous back yard with multiple outdoor entertaining areas including a gas fire-pit, built-in BBQ island with seating for 8, high-quality artificial turf, lush landscaping, and best of all - a newer AlumaWood (all aluminum) patio cover that you'll swear is real wood. Edison lights create that Summer glow your guests will love as you sip your beverage, listen to music, and enjoy great dining al fresco. This home promotes casual and comfortable living with an easy-flow layout. Total care has been given to reduce maintenance costs and this home provides LED lighting, drought tolerant landscaping, and artificial turf. Come see it today." "Get your checklist ready! Situated in the highly desired, gated community of Cantara, at the end of cul-de-sac, on a large view lot,this home just might have it all. Enjoy the shade of the covered backyard patio or a swim in the heated pool. Turn on the water feature and enjoy the canyon and sunset views. Inside you'll find the largest model in Cantara (over 3,400 square feet), with 4 bedrooms; a downstairs office (or 5th bedroom) with en-suite bathroom; and 4 1/2bathrooms. Soaring ceilings and windows in the entry, living and dining rooms invite an abundance of natural light. Upgraded flooring includes custom travertine tile downstairs and newly installed carpet upstairs. Even your cars will have the space they need in the 3-car dual garages (one single and one double bay). A dual HVAC system; automatic sprinklers; mature plants, producing Myer lemon and blood orangetrees; drought tolerant landscaping; easy access to shopping, restaurants, parks and schools. This is Moorpark living at its finest!" "Beautiful, peaceful, enchanting, rare combination of essential qualities to be seen n to enjoy in this rare one of a kind view home..Remodeled high end kitchen area, w Viking stainless steel appliances,center island, free standing stove, a romantic master bedroom with hardwood flooring , beautiful master Roman bath retreat,2 sided fireplace, jucuzzi tub, huge walk in closet, water fountains in the front n backyard, private hot tub, lush landscaping n pond, several patio areas for enjoyment, good mtn views from the front of the home, n upstairs balcony n 2 large bedrooms, good curb appeal, w slate entry n landscaping, plenty of street parking, huge 3 car garage w overhead cabinets lots of storage, Noritz tankless water heater, 5th bedroom downstairs is used as a library w expensive African ribbon Mahogany wood shelves..high end quality travertine flooring thru out, beautiful hardwood floors in the living room w Classic Tuscan travertine fireplace,built in '98 w newer earthquake codes, good floorplan w cathedral / vaulted ceilings thru out,, elegant formal dining that looks out to beautiful water pond tree trellis starting to bloom..custom window treatments w plantation shutters. Every room was well thought out .Capture the Vision n beauty upon views"
"Ultimate Entertainment Pool Home W/ Mountain Views On A Cul-De-Sac! Bright & Open Floor Plan, 4+2.5, 3079 SF& 11,478SF Lot. Dual Pane Windows, 2Fireplaces, Travertine Floors W/ Granite Inlays, Custom Drapes & Fresh Paint. Upgraded Kitchen W/ Granite Counter-Tops, Double Oven, Dining Area, Newer Built-In Microwave & Dishwasher. Formal Dining Room Off Spacious Living Room. Game Room W/ Over 500 SF, Surround Sound Speakers, 2 Ceiling Fans & Many Windows To Enjoy The Pool Views. Family Room Has Brick Fireplace W/ Custom Mantle & Wet Bar. Master Suite Has Double Door Entry, Ceiling Fan, Walk-In Closet, Sitting Room & Large Balcony W/ Breathtaking Views. All Other Bedrooms Have Mirrored Closet Doors & Some Built-In Storage. Resort Style Backyard W/ Custom Pebble Tech Pool & Spa Designed W/ Stacked Stone Flagstone, Multiple Waterfalls & Island Step W/ Water Feature. Surround Sound Speakers, Grass Area, Tropical Palm Trees W/ Malibu Lights & Umbrella Inserts Throughout. BBQ Station W/ Granite Counter-Tops, Bar Stools, Built-In Stainless-Steel Outdoor Burner, BBQ & Refrigerator. Laundry Room W/ Mop Sink & A/C. Finished 3Car Attached Garage W/ Epoxy Floors, Built-In Cabinets, Ceiling Fans & Built-In Speakers. HUGE Gated RV Parking 51x22'W/ Cover & 30 Amp RV Outlet." "Magnificent Moorpark home located in the highly desirable Deauville tract. Excellent curb appeal with front entry fountain. This lovely property features 5 bedrooms, 4.5 bathrooms, with a bedroom and private bath located downstairs. Open floor plan with large living room and fireplace, formal dining room, and spacious family room with beautiful tiled fireplace. Gourmet kitchen with granite counter tops, center island with sink, and stainless appliances. Huge master suite with tiled fireplace., engineered flooring, ceiling fan, and shutters. Master bath with separate soaking tub and shower, updated flooring, and motion sensor lighting underneath the cabinets. Private rear yard will make you feel like your relaxing in an oasis with lush landscaping and several fruit trees. 3 car garage. Community pool/spa. Close to shopping, schools, and parks. An amazing home!"